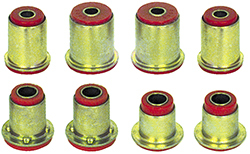 Installing performance polyurethane bushings will give you an incredible improvement in handling and control no matter what kinds of demands you place on your vehicle. This front control arm bushing set will help maintain better alignment wh ile cornering, under hard acceleration or braking better than flimsy, soft OEM rubber bushings. Better caster and camber is maintained during demanding driving conditions thanks to the correct durometer firmness of polyurethane.